Welcome to "Hamming It Up At the Movies" sponsored by Hambo Stamps! Today Hambo customers and the Bacon Bits Design Team are bringing you fun creations that depict movie titles! It might be your favorite movie, or just one that was fun to design. If you arrived here from Melissa's Blog you are in the right place! If not, you might want to start back at the beginning at the Hambo blog to make sure you are eligible for the hopper prize! A prize will be awarded to one participant whose movie-themed creation tickles the Bacon Bits’ fancy in a hammin’ jammin’ way! Another prize will be awarded randomly to a hopper who comments on all the blogs along the way. The winners will be announced on the Hoedown blog, as well as on the Hambo company blog, Talk to the Ham, on Wednesday, May 25. My creation is a Father's Day card to my lovely husband. He is our super hero! 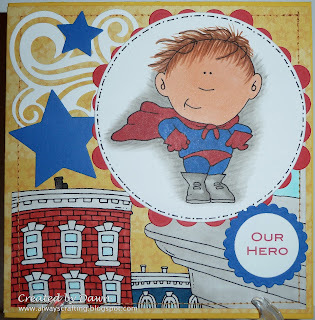 As you guessed my card depicts the movie SUPERMAN! 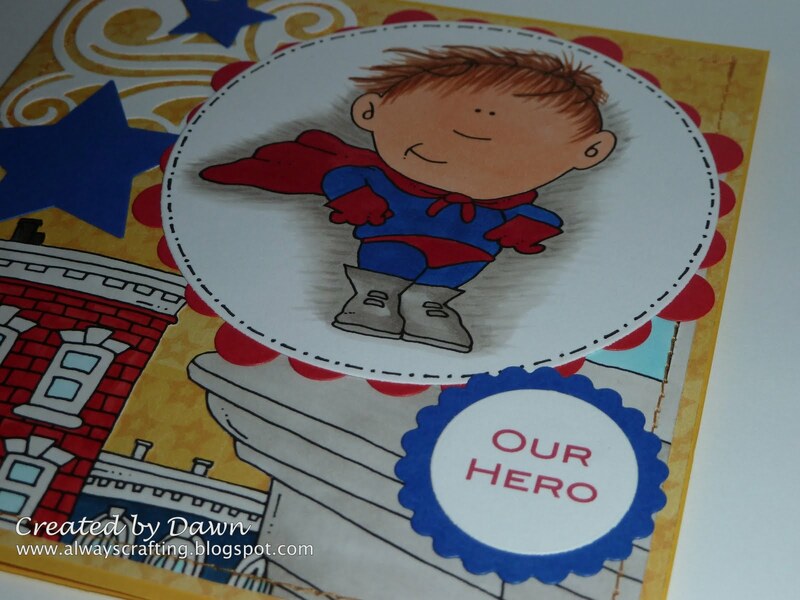 As soon as I saw the Wee Henry Hero digital image I knew it was perfect to use for my husband's card. You can get this image HERE. I also used the Hambo Buildings/Ledge digital image on this card. You can get that image HERE. Now dance on over to Silke's Blog for another great movie scene! This card won at the Cardmadfairy's challenge - For the boys!!! HERE!! Hi Dawn! Your card is so darn cute (in a manly super-hero way, lol)! 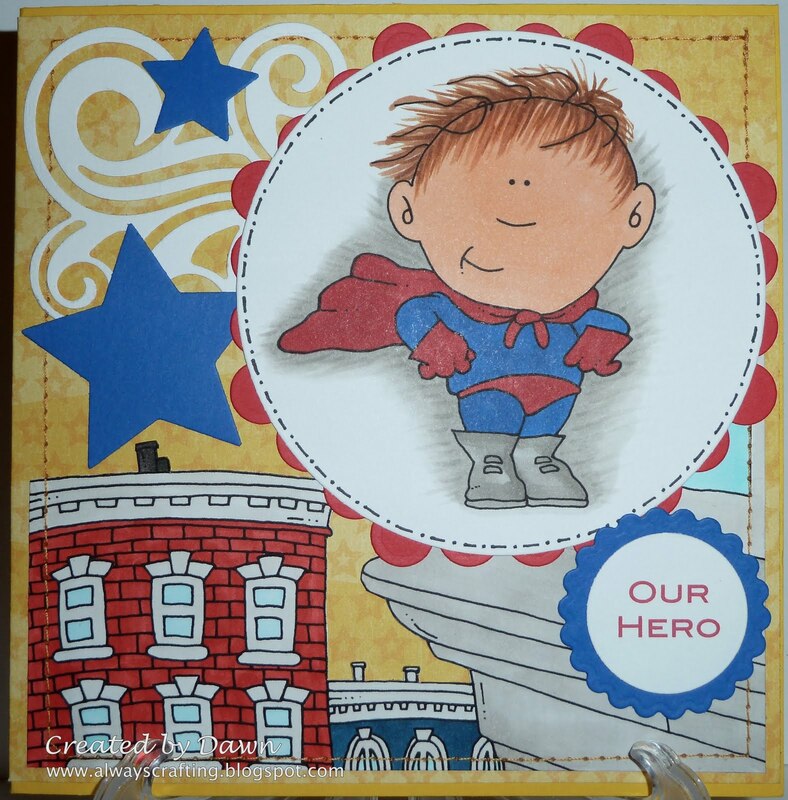 Fab use of the background stamps and your coloring is really great. Love this! I'm sure your husband will, too! Super cute card with such great coloring, Dawn! So glad you joined us in the Hop today~! Oh, how cute it THIS?!?!? Just adorable! Haha! I just LOVE it! What a cute Superman! Great idea for a card! Your colouring is great too! Great card! These digis are great...nice to be able to get the background one that works perfectly with the main image. Terrific color combination too. I love the yellow! He is such a handsome superman. Your coloring makes him so. Wonderful movie pick for this image. I LOVE his hair! Great card! I love the images you used, too. Yolanda I LOVE your adorable Superman card!! Having him up above the buildings is so smart, and the way you colored his hair and the shadow around him gives so much movement to the card! I can practically feel the wind blowing! LOVE LOVE LOVE it!! Great idea!! I love the way you colored the superhero. Love it. very very cute, love superman! What a perfect Father's Day card & a creative way to use these 2 fab images. That is completely sweet. He will love it. The ledge background is perfect. I love his windblown hair and the "wind" flourish behind him! Great job. Super cute card Dawn! Love the scene! The linky seems to be fine now so I went ahead and linked you up :) Thanks for being Odd! Love his hair!!! Great job!! This is a super card. Lol. I really love this. Thanks for sharing. Oh my goodness, what an adorable card. One of my favorites so far! oh my Dawn, this is SUPER cute!!! I love your design with these images...you really showcased them well!! That is totally awesome, I love it! Thanks for joining us at Cardmadfairy's Digi Days Challenge. Love this image and card! The background is very cool! This is so cute, it made me smile! Great placement of your elements. Thanks for participating in the Creative Belli Challenge. Oh this is totally fabulous what a great image and design just perfect for our challenge at Digital Tuesday thank you for joining us this week. So cute! Fantasic movie choice and darling card! I love that card! Great use of the various digis! Superman was always one of my favorites! GREAT JOB!